A great place to relax and unwind before and after your Uluru tour. All dorms have air conditioning, fridge, brand new beds with comfy spring mattresses and security lockers. 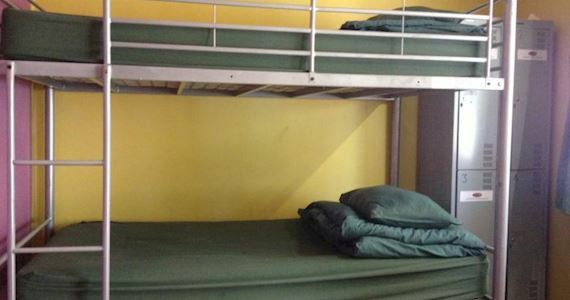 Choose from large/small mixed or female dorms, doubles or twin. All linen is supplied. Come and see why travelers find Alice Lodge the best place in Alice Springs for a fun, clean, happy stay and why solo travelers find it an easy place to make new friends. Reception closes at 7pm, so if arriving after this time please let us know so we can arrange a late check in. **FREE FREE FREE** – FREE – Internet and WIFI available 24 hours a day – FREE – Breakfast containing-3 x cereals, toast, tea, coffee and lots of Milk. – FREE – Luggage Storage while your on tour – FREE – Valuables stored in safe in office – FREE – Individual locker usage in dormitories **OUR FACILITIES** A Sparkling Swimming pool and Suntan area, TV & DVD lounge, Fully equipped Kitchen/Outback BBQ, laundry facilities and relaxing hammocks. – Sparkling Pool – A/C & fridges in all rooms – BBQ / Grill Area – Fully equipped kitchen – Laundry – TV/Chill-out Room.